On Wednesday afternoon we set off from Royal Quays, out into the North Sea, onboard the MV King of Scandinavia as guests of DFDS. The weather forecast was for it to be wet, although we did manage a couple of hours birdwatching from the observation lounge before the driving rain obliterated the view. Gannets were diving into the increasingly heavy swell, a stunning Pomarine Skua arced across the bow of the ship and a single Puffin was tagging along with six Little Auks. Arriving in IJmuiden the next morning, it was still raining 🙁 We were collected from the ferry terminal by Lin, a local guide who we had been introduced to by the ORCA wildlife officers from the ferry. As we headed north Egyptian Geese were around the grass verges near the port, Cormorants were perched atop most of the lampposts, Common Buzzards were on roadside fences and we saw one lingering Spoonbill. Our destination was the reserve of Zwanenwater, where Lin is a volunteer. As we walked through the reserve the high pitched ‘seep’ of Redwings was a constant backdrop, Song Thrushes were flushing from every patch of cover, every bush seemed to hold several Robins and a Common Redstart flicked up from the path in front of us. We were then taken on a tour of the off-limits areas of the reserve by Fred, another of the volunteers. 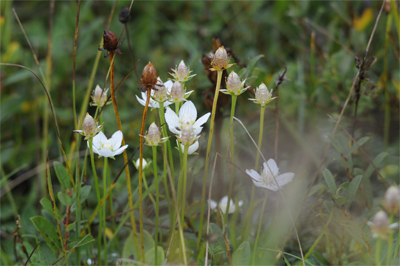 Stonechats were seen along the track and there was an impressive spread of Grass of Parnassus. 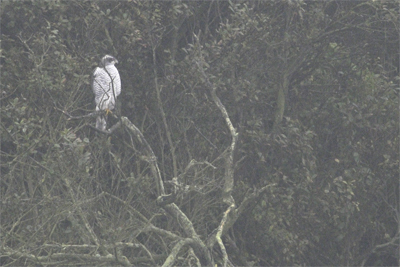 Despite the rain we managed an impressive haul of raptors; Common Buzzard, Marsh Harrier, Hen Harrier, Kestrel, Sparrowhawk and Osprey were all seen well but, most impressive of all, the real highlight for both of us was the views we had of Northern Goshawk. The birds quartering the dunes in search of rabbits and small birds came as a bit of a surprise, but not as much as the two birds that were perched on dead trees overhanging the lake. Fred explained that they sit there and watch the ducks, before swooping down and taking them off the water. 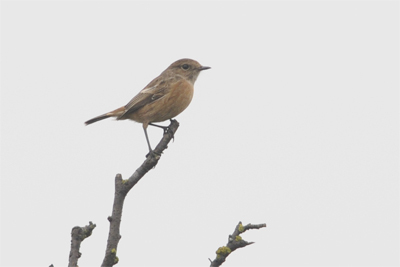 We didn’t see that, but we did manage some distant images of one of the birds. All too soon we were on the ferry again and heading back to Northumberland, making plans to return to Holland in the spring. Even though we live in southeast Northumberland, we’ll never tire of getting out and about searching for new experiences for our clients. Days out with clients are always exciting as well, because we never know exactly what we’ll see or what it will be doing. Last Thursday we had a Southeast Northumberland/Druridge Bay safari with clients from a fairly wide geographical area; Jeff and Jean from Huddersfield, Lawrie and Linda from Glasgow and Yvonne from southwest Northumberland. Starting at Newbiggin we managed a brief view of a Mediterranean Gull on the beach, and a small flock of Sanderling. These little grey, white and black ‘clockwork toys’ are always entertaining as they scurry back and forth along the water’s edge. The River Wansbeck was our next destination. As expected there was a good sized flock of Lapwing roosting and Cormorants and Herons were doing what they do; standing with their wings out and just sort of standing respectively. All of a sudden a wave of panic spread through the Lapwings. We all scanned backwards, forwards, skywards but couldn’t see any cause. Perhaps it was just a false alarm? The birds settled but were up again within a minute, gradually settling back down with a great deal of conversation between them all. Greenshanks flew by calling and the Lapwings were becoming increasingly jittery. Even birds from distant streams were high in the air, forming the quite tight flocks that indicate the presence of a predator, something that creates anticipation wherever we’re birdwatching. Eventually we found a distant Peregrine, and a big female Sparrowhawk slid menacingly through the trees opposite our watchpoint. One or both of them was presumably the cause for concern. Even the Great Black-backed Gulls flushed and flew overhead, giving calls of consternation. Among the coastal waders, perhaps the best were three Common Snipe, unusually confiding and just a few metres away from us. The fall of passerine migrants earlier in the week had left a few goodies behind. Spotted and Pied Flycatchers were quite elusive, sallying forth and then back into cover, Willow Warblers and Chiffchaffs were picking their way through willows beside the path and, providing a visual feast to rival the gaudiest of birds from elsewhere in the world, six male Common Redstarts were along one short stretch of hedge. There really is little to rival the beauty of these birds.